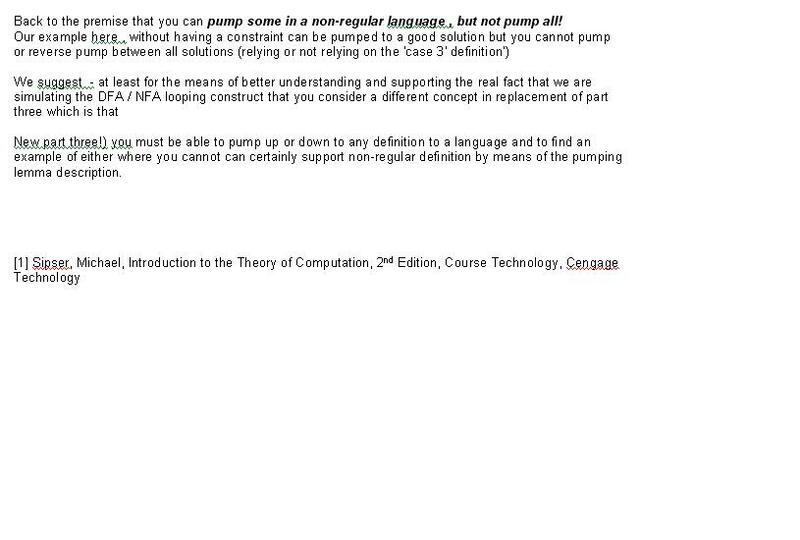 What is the pumping lemma and why do we care? Essentially we are hand-simulating the dfa loop. The pumping lemma is only used to prove nonregularity in languages. you might ask : 'how do i prove a language is regular'? 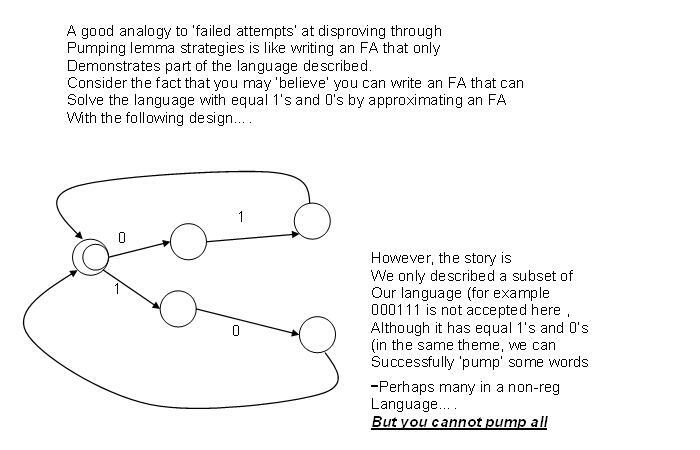 no known theorem - you don't need one - as you can prove regularity by writing a dfa/nfa/ regular expression to express the language. Another big issue here is that at times (with tricky languages) you can actually 'pump' non-regular languages - in certain places and do so successfully. This does not violate the pumping lemma as you may (at times) have to be careful about which substring you pump. so you only proved part of the language. 'z' is the only variable that can be specified as empty string – or least allow any utility towards a solution in this capacity…. Because we know we won't solve anything (prove) by setting v or y to null (note: at least one must be non-null) but the true power that gave us a larger set of languages was the fact that we could pump in two areas (representing the power that we utilized the 'stack' to represent) - so we won't set either to null… it just wont produce a meaningful solution. For part two , vxy have to be less than or equal to p (really no meaningful case would consider that they are equal for that would be imply that y was null – again not supporting a meaning ful way of proving anything here – since you are negating the power of the two area pump which gave us more power than the one area pump on the RE-lp! Pp 127 considers o to power p as w.
Now you have completely fooled someone into thinking that you can pump this to an equivalent language. It works for 00000010000001 ! However, there are cases where it still doesn't work! If I cannot solve it with one then it is not CF!